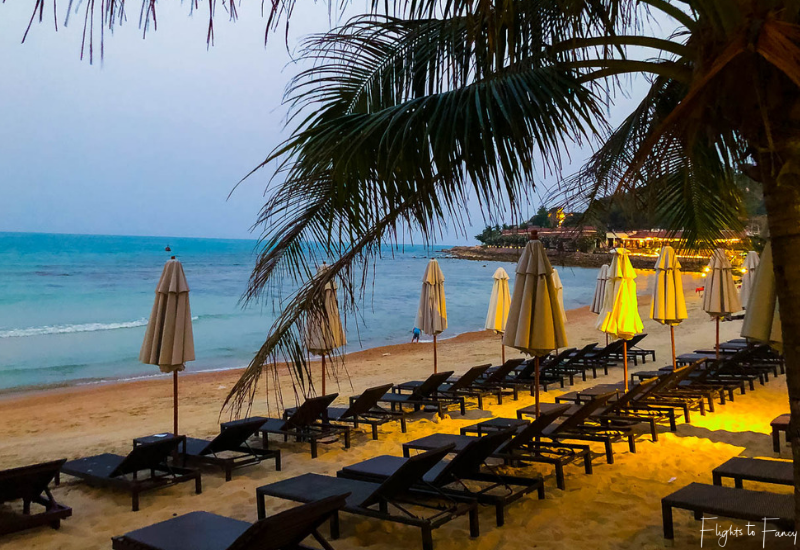 The Impiana Resort Chaweng Noi is a premier luxury hotel in Koh Samui Thailand that commands an enviable position on one of the island’s most coveted stretches of sand. 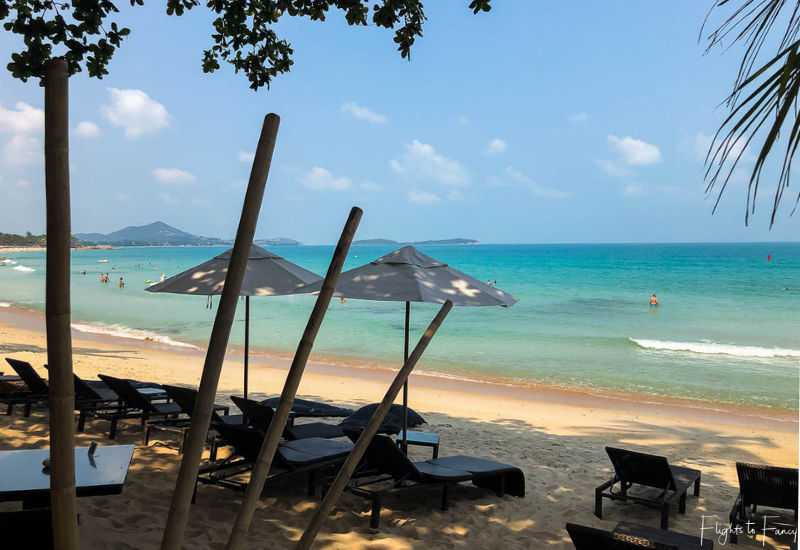 The absolute beachfront location was certainly one of factors that swayed us towards Impiana Resort when we were making the tough decision of where to stay in Koh Samui. While Koh Samui has many lovely areas, Chaweng Noi was perfect for us. Close enough to the craziness of Chaweng that we could pop in at a moments notice, but far enough away to be able to find the peace and quiet we craved. 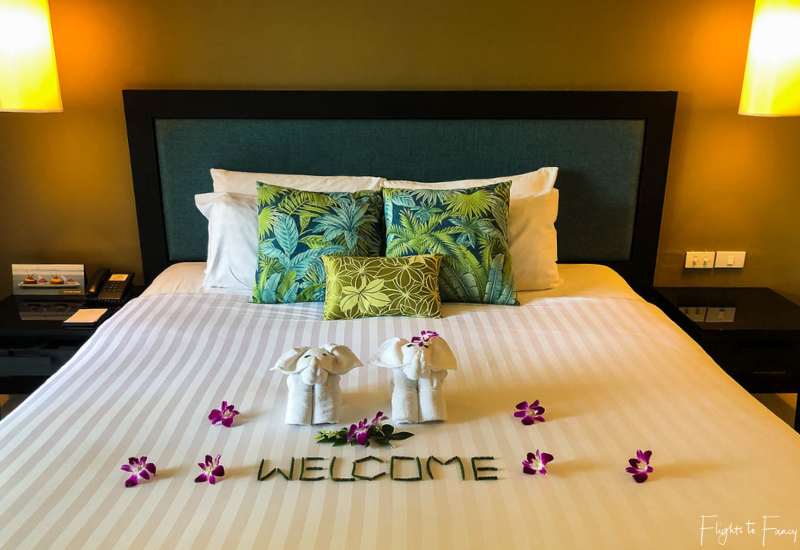 From the moment we arrived at Impiana Resort Chaweng Noi we felt very welcome. Dark timber dominated the spacious reception which was decorated in traditional Thai style. 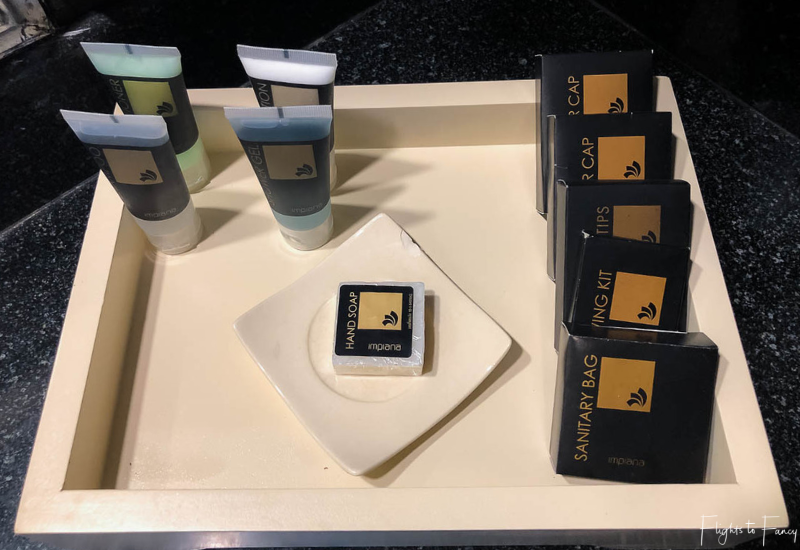 June greeted us fondly, checked us in efficiently and presented us with three vouchers; a complimentary 15 minute massage, 10% off tours and 30% off laundry. Make sure you book in your complimentary massage early as Swasana Spa fills up quickly. 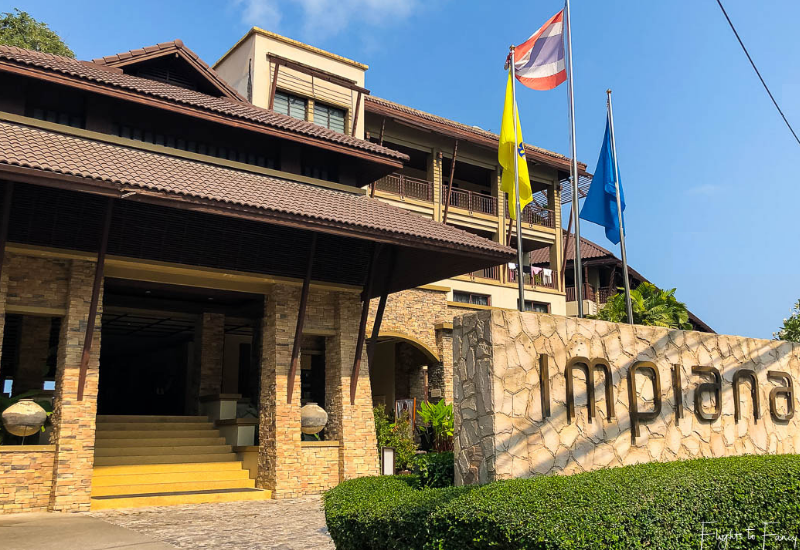 Impiana Resort Chaweng Noi obviously caters to leisure travellers like The Hubs and I, but it also works for those travelling on business. Conference facilities are available for up to 40 delegates and you can organise exclusive use of your choice of facilities. They can even host your dream destination wedding on magnificent Chaweng Noi Beach or the lush lawns of the resort. 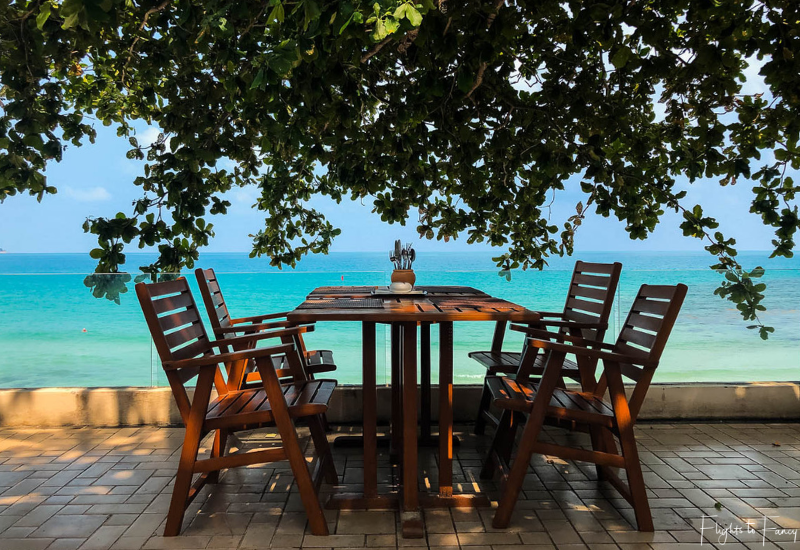 Impiana Resort Chaweng Noi prides itself on its service and empowers staff to deliver an outstanding experience to all their guests. They can organise baby sitting, tours, activities and even complete foreign exchange transactions. The length staff will go to make your stay exceptional was demonstrated many times during our three days at Impiana Resort Chaweng Noi. Massive shout out to Ting, Sunny, Rong, Mas and Aek who all made our stay memorable. While we had an AIS tourist SIM, fast free WiFi is available throughout the resort to keep you connected. Trust me, you will need it to upload all those Insta worthy beach pictures. We travelled from Krabi to Koh Samui with Lomprayah and arrived at around 1.15pm. 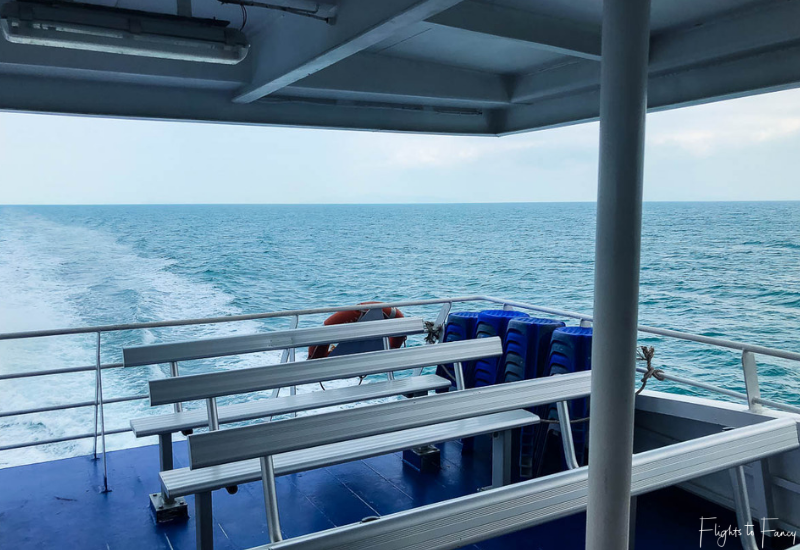 We booked our trip through 12Go and paid just AUD$25 each which included pick up from the Ananta Burin hotel in Ao Nang, transfer to the Lomprayah bus terminal, a luxury coach to Tha Thong Pier and the Lomprayah high speed catamaran to Nathon Pier Koh Samui. Once at the pier you can grab a taxi to your hotel reasonably easily. The fare will be around ฿600 – ฿800 (~AUD$27 – ~AUD$35) on the meter, but savvy travellers will organise a ride ahead of time with Klook for under AUD$5. We arranged our transfer through Impiana Resort Chaweng Noi and our driver was ready and waiting when we disembarked. He whisked us away in a very fancy bus for the 40 minute run to Impiana Resort. Koh Samui was our last stop in Thailand and while we arrived by boat, we left by air because it was convenient to connect with our Jetstar International flight from Phuket back to Sydney. 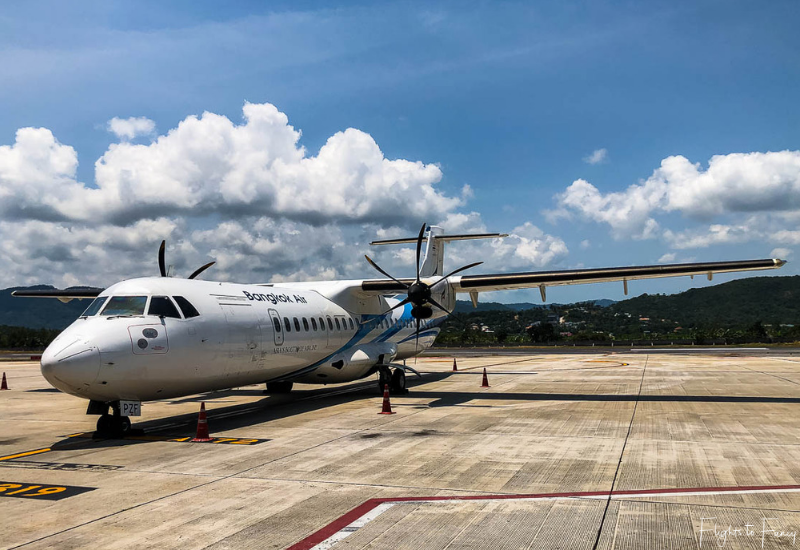 Koh Samui International Airport (USM) has direct domestic flights from Chiang Mai, Bangkok, Phuket, Krabi and Rayong as well as international direct flights from Kuala Lumpur, Singapore, Hong Kong, Chengdu and Xi An. We flew with Bangkok Airways because they were the only airline offering direct flights from Koh Samui to Phuket. Impiana Resort Chaweng Noi kindly provided a free airport transfer for us as part of their normal shuttle bus run. After we dropped off the other guests at Central Festival Koh Samui our driver continued on for another 5 minutes or so to Koh Samui International Airport. We even had WiFi available on the bus which was an unexpected bonus. Impiana Resort Chaweng Noi has 96 guest rooms over several categories. We chose a superior seaside room and booked through Agoda for just AUD$184.10 per night. We were allocated room 119 which was tucked away in the northern corner of the resort. Our patio had brilliant beach views and we were just 87 steps from the sand. Yes I counted! The only downside was that the path directly in front of our room had a steady stream of foot traffic. 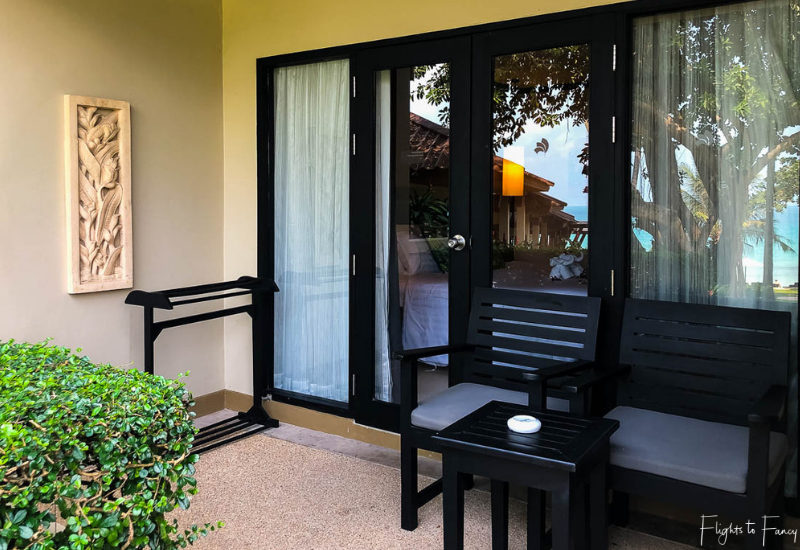 If privacy is more important that a view, rooms 121 and 122 are just a few doors down, but are tucked behind the beach block away from prying eyes. The room itself was compact, but it was tricked out with everything we needed for a comfortable stay. 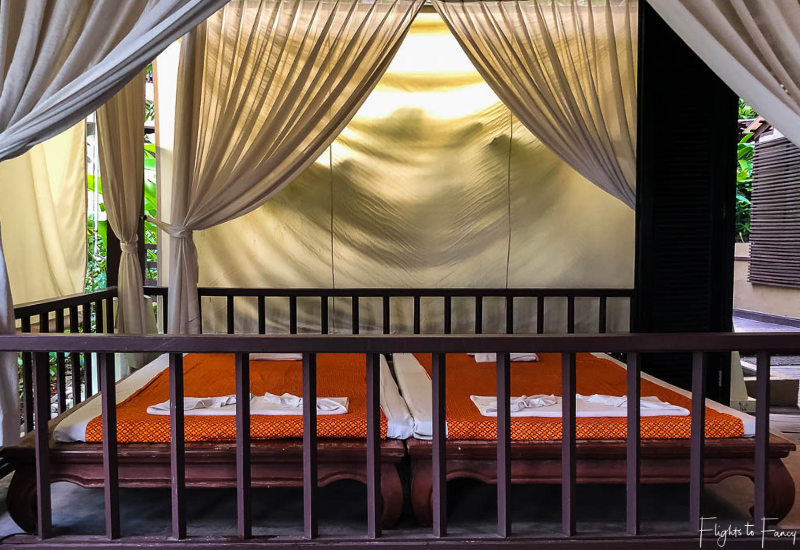 For some reason Thai’s have a penchant for hard beds and I always walk into Thai hotel rooms with some trepidation wondering exactly how hard the bed will be. The towel elephants and welcome message which adorned the bed brought a smile to my face as I approached. When I stretched out my fears were allayed. A little firmer than I would like, but nowhere near as hard as some other hotels in Thailand I have experienced. Both sides of the bed were flanked by international power points so we could both charge our phones while keeping them handy with no need for an adapter. 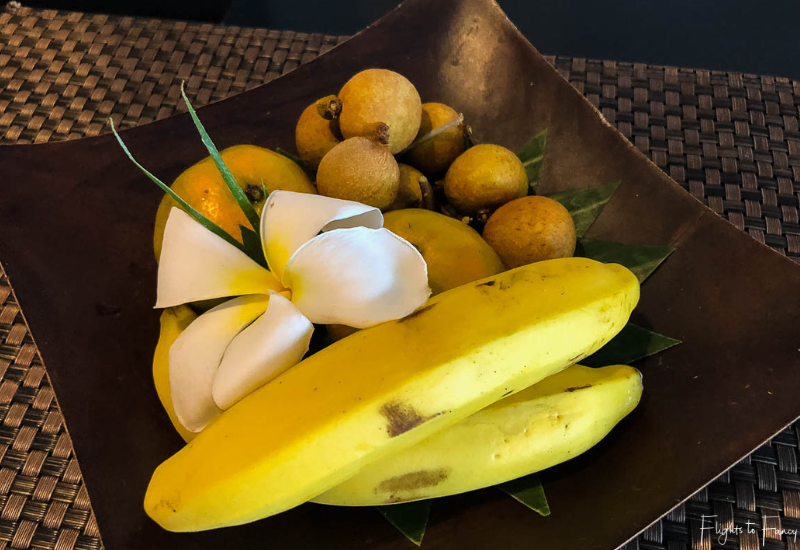 A welcome fruit platter was thoughtfully placed on the desk along with complimentary bottled water that was refreshed daily. We found ourselves rising early most mornings and making the short trek across the lawn for an early morning beach swim. The urn of fresh water on our patio was handy to wash our sandy feet before heading back inside, but our room lacked a door mat to remove the last traces of sand and water. 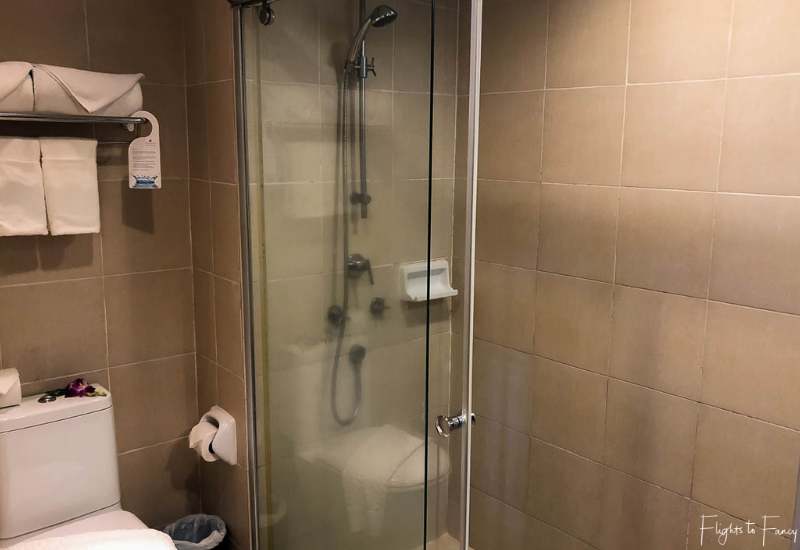 The bathroom was at the rear of the room and the shower boasted my preferred hand held wand as well as a fixed overhead faucet. 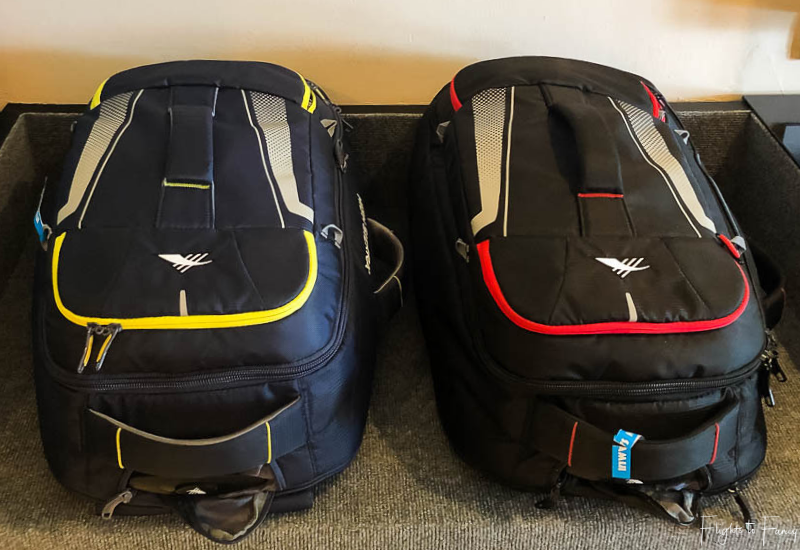 We don’t tend to unpack for short stays and the luggage rack easily accommodated both of our High Sierra wheeled duffels. If we did want to unpack, the generous double cupboard provided ample hanging space and was well equipped with thongs (flip flops), robes, umbrellas, a torch, a safe, an iron and an ironing board. The safe was a little smaller than most and I had to angle my laptop to fit, but where there is a will there is a way. Access to the room is by two full height glass doors to make the most of the gorgeous views. I found out the hard way that they lock as soon as they are pulled to. I snuck out one afternoon to take some photos of the resort while The Hubs was squeezing in a sneaky snooze. I left the key in the slot so the air conditioning would not turn off on him and I realised as soon as I closed the door that I was locked out. He was less than impressed when my pleas to be let in disturbed his slumber. The heavy curtains that obscure the doors at night did an admiral job of blocking early morning rays. Like most tropical locations, mosquitoes are a concern in Koh Samui. There was a large gap above our door so even when it was tightly closed those pesky little critters still found their way in. Luckily we had plenty of bug spray on hand to keep them at bay. A fridge was stocked with the usual mini bar items, but we still had enough room to fit our own items without playing tetris. 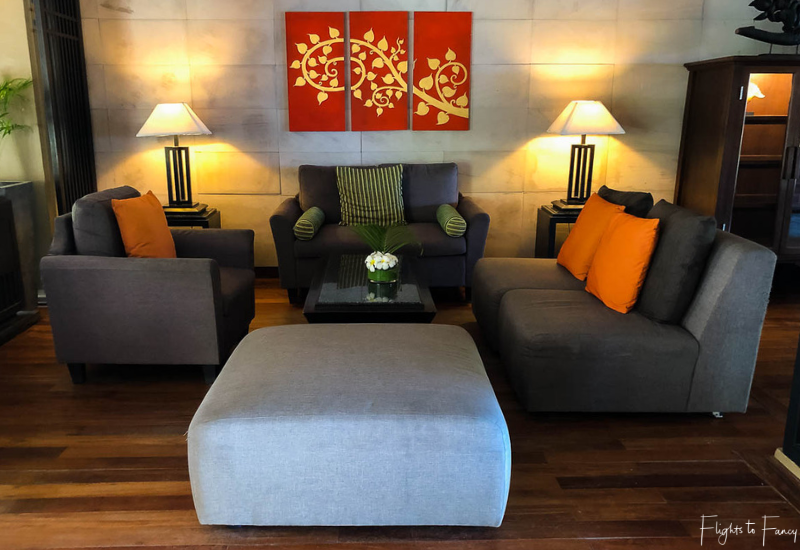 Impiana Resort Chaweng Noi ensures your comfort by providing housekeeping services twice daily. On the first pass your room is thoroughly cleaned, while the beach towels are refreshed again on the second visit in the evening. We had one day of rain during our stay and found ourselves caught in a sudden downpour which soaked us to the skin. The rack on the patio was put to good use to dry our sodden clothes. Impiana Resort Chaweng Noi had apparently thought of everything and we wanted for nothing during our stay. Impiana Koh Samui luxury hotel comes with a raft of facilities. In fact, you may never want to leave the resort. 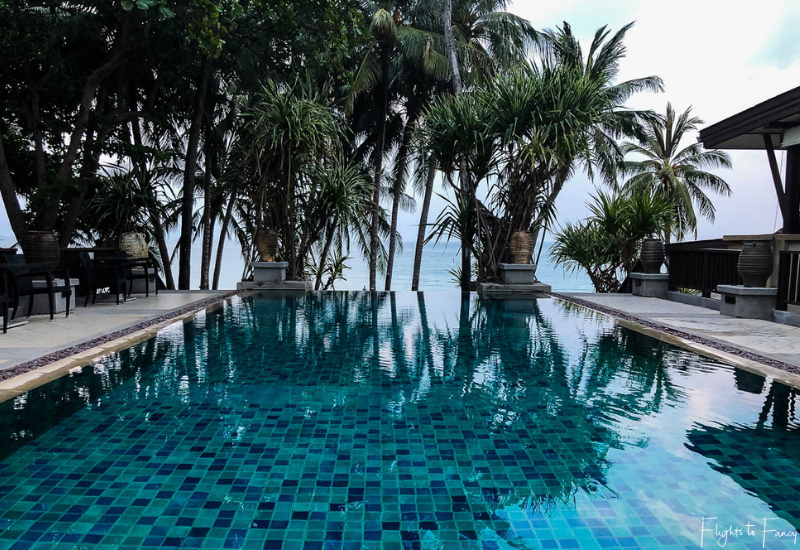 If you get tired of swimming in the crystal clear warm waters of the Gulf of Thailand, head to the sparkling infinity pool for a dip. There is also a separate kiddies pool for the littlest guests. 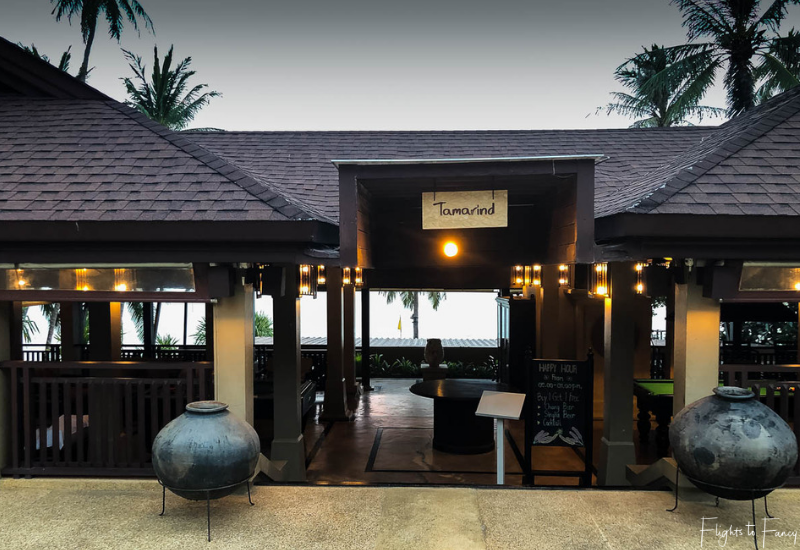 After drying off, gather a group of friends at the Tamarind Bar and Lounge. The Thai menu will satisfy hunger pangs and an extensive cocktail list will quench any thirst. 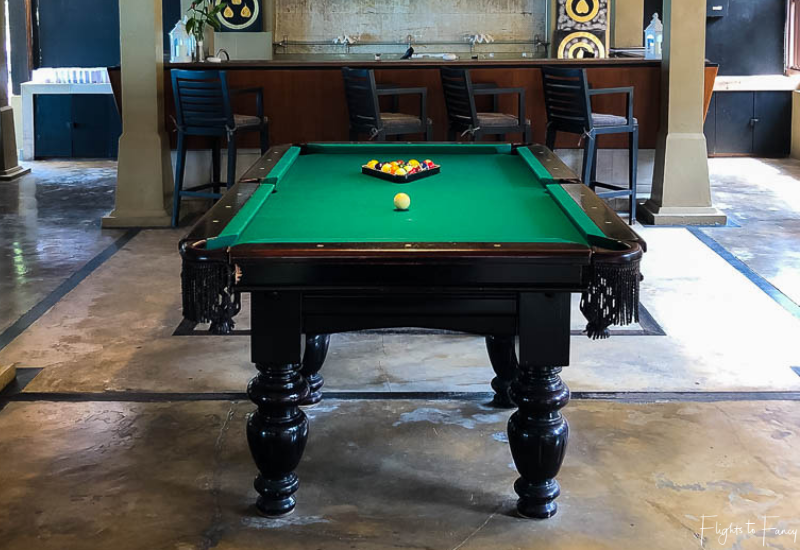 Head to Tamarind at happy hour (between 5pm – 7pm) for two for one Changs, Singhas or signature cocktails and try your hand at a game of pool or air hockey while you are there. The complimentary shuttle bus at Impiana Resort Chaweng Noi ferries guests between the resort and Central Festival three times a day. 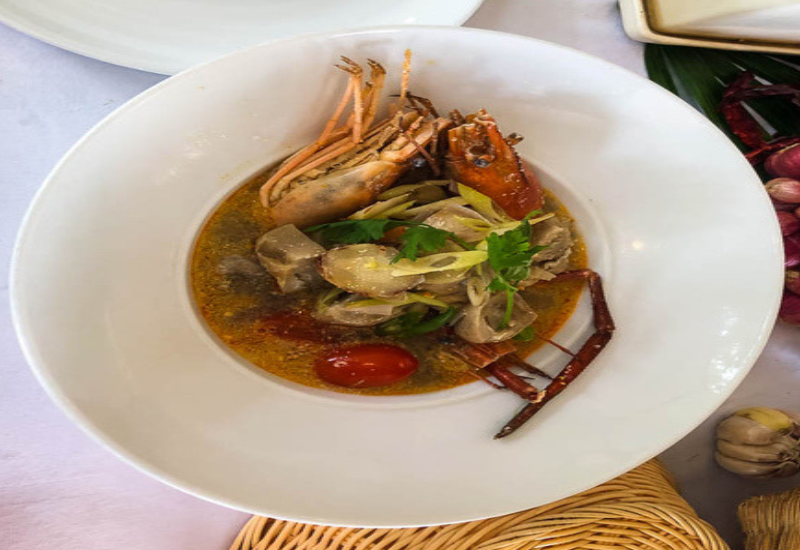 On Fridays and Sundays the bus makes an extra trip to Bophut Fisherman’s Village and Lamai to coincide with the night markets for a small charge. 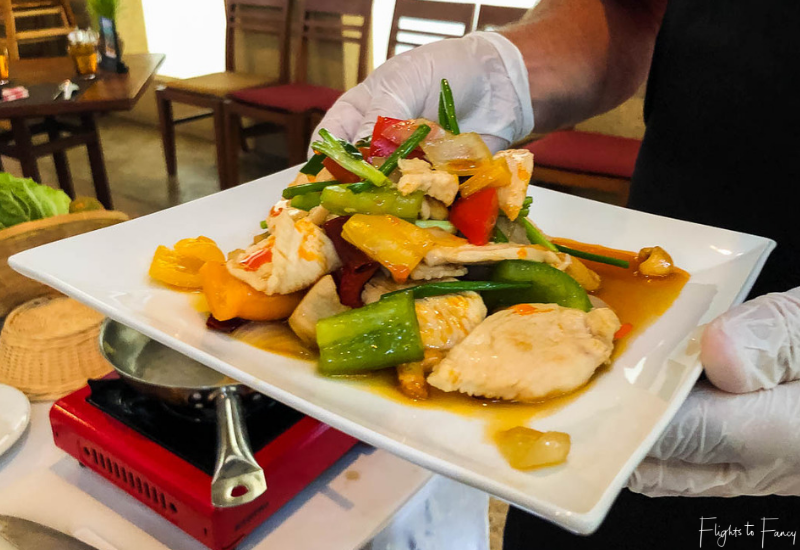 Impiana Resort Chaweng Noi offers room service between 11am – 11pm for when it’s just to hard to leave the room for sustenance and reception is open 24 hours for your convenience. 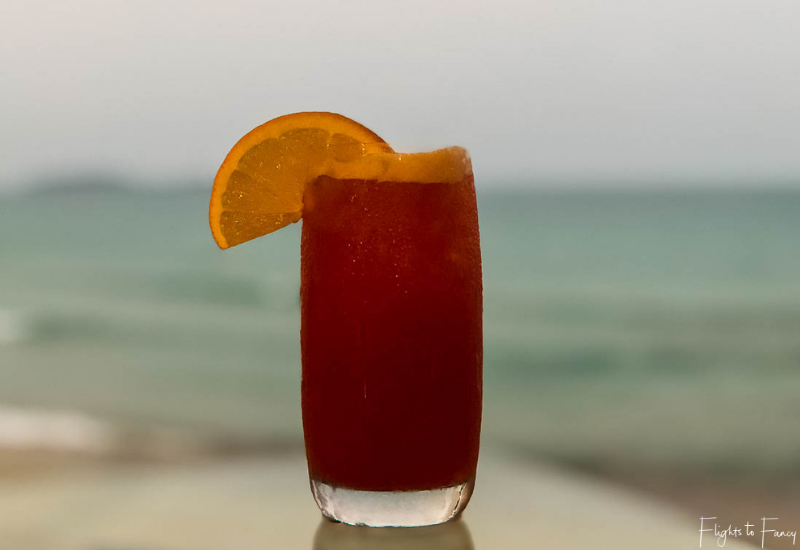 No tropical vacation is complete with a cocktail or two. Or Three. 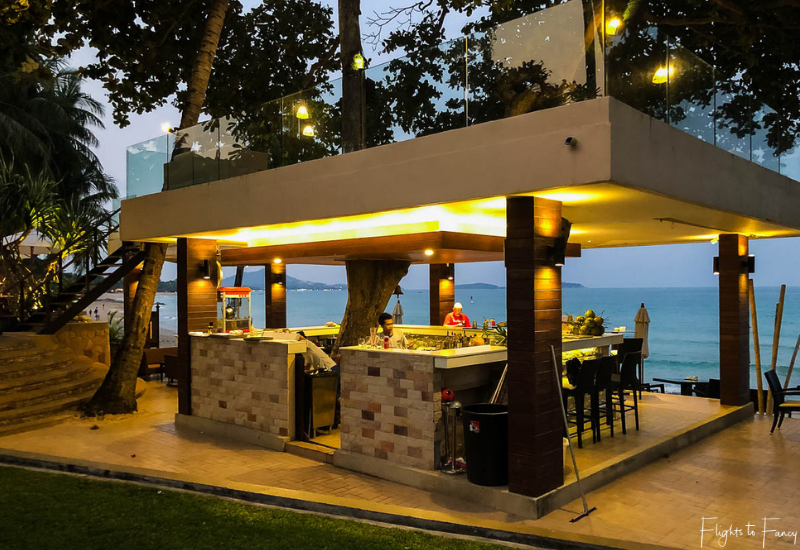 The beach bar at Impiana Resort Chaweng Noi is THE place to get your fix. We wandered down every night at happy hour (5pm – 7pm) and Ting was our man behind the bar. Two for one local beer and cocktails are served up with some of the most amazing sunsets you are likely to see in Koh Samui. 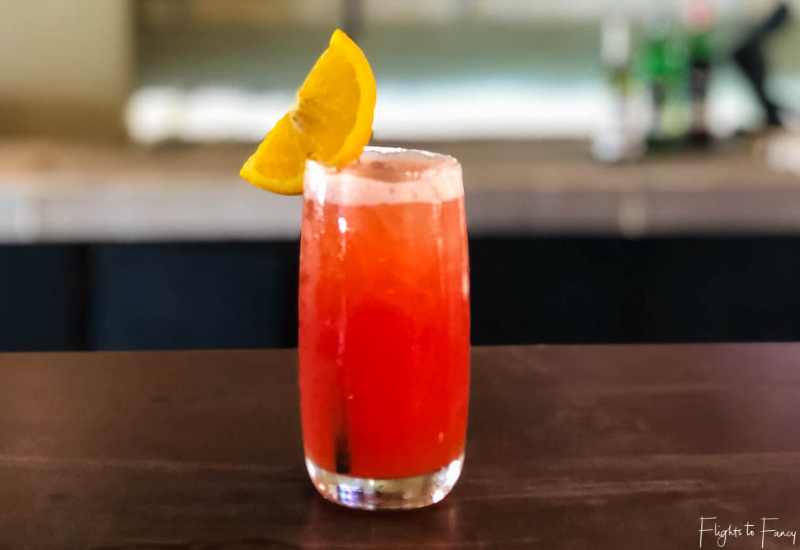 Try the Zombie or ask Ting to go off menu and make his signature cocktail, the heart breaker. 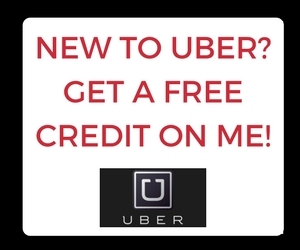 You won’t be able to stop at one and at half price you don’t need to! “They” say breakfast is the most important meal of the day. 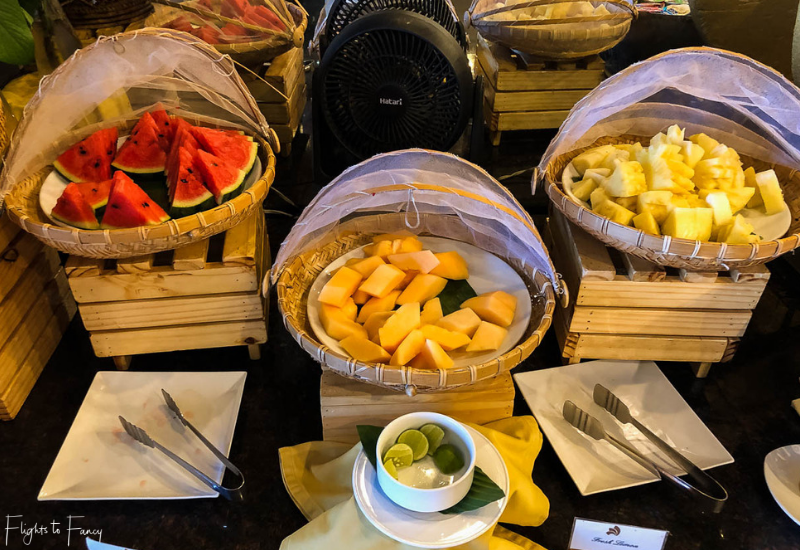 I don’t really subscribe to that philosophy and rarely eat brekkie at home, but given breakfast was included in our stay at Impiana Resort Chaweng Noi it would have been rude not to check it out. 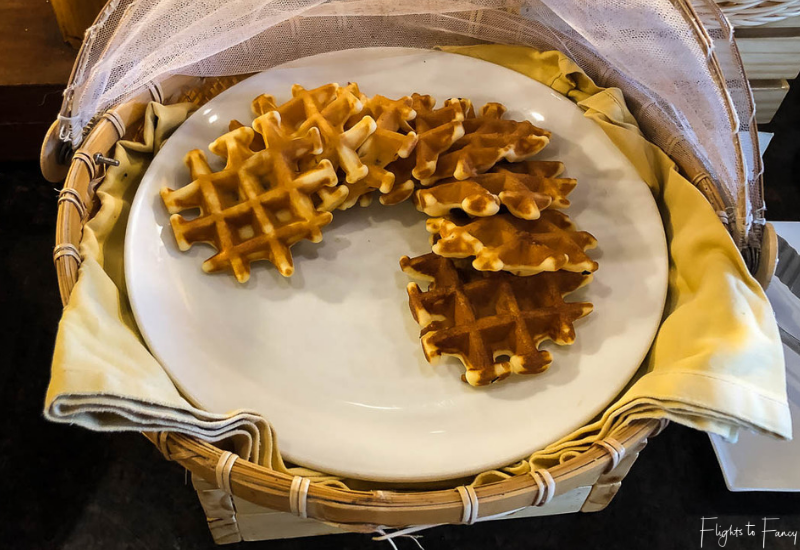 Breakfast at Impiana Resort Chaweng Noi is served daily at the beachfront Sabai Restaurant from 6.30am. Diners are offered a reasonable selection of both western and Asian dishes. 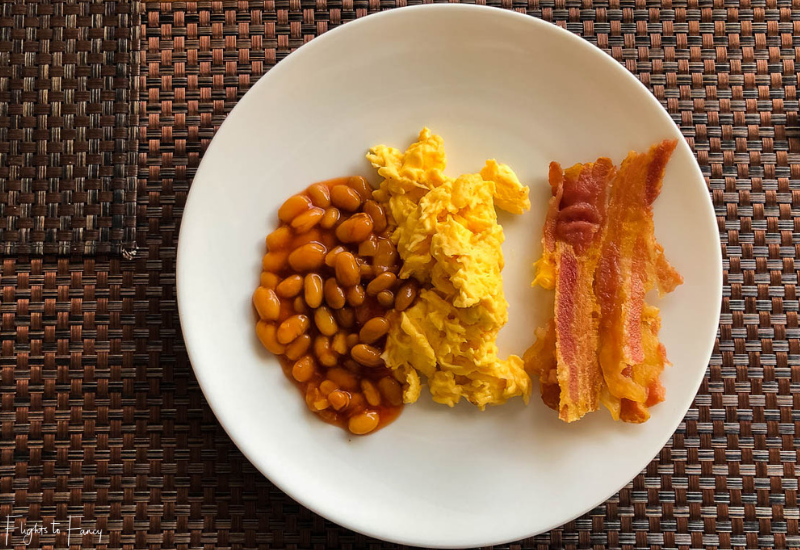 The Hubs headed straight to the egg station for his fix of scrambled with bacon and beans from the buffet. The bacon is served American style and not the way I personally like it. Short cut is the only way I eat bacon these days. The noodle bar was doing a roaring trade as I passed by to fill a small bowl with rice and Thai green curry. Yes for breakfast. When in Rome right? 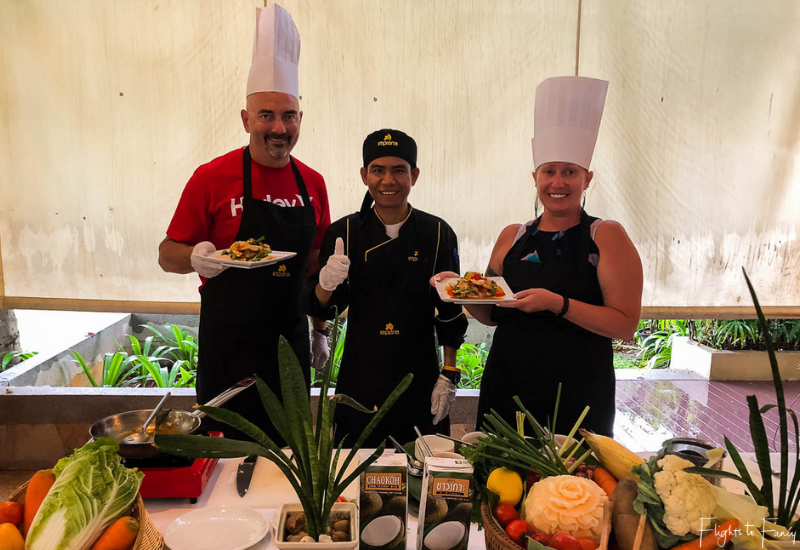 The potatoes were almost gone when we arrived, but I spotted Rong (the chef from our Thai cooking class – see below) who got right on it. Not only did he restock the buffet, he made a point to deliver a plate direct to our table. Now that’s service! 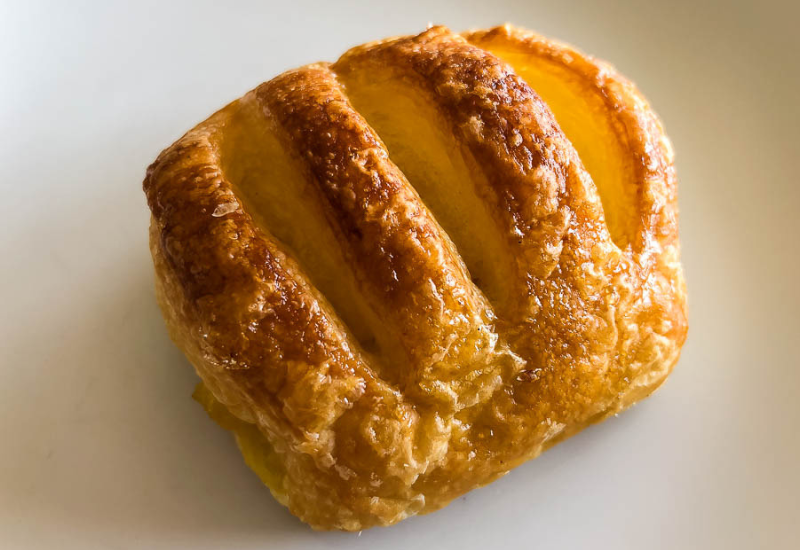 A couple of slices of toast, an orange juice, a custard Danish and some fresh fruit rounded out our meal nicely. 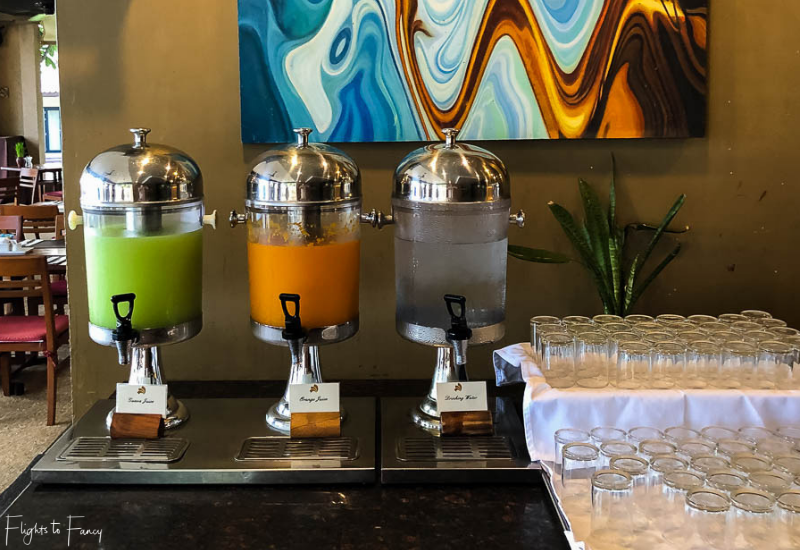 Those who need a caffeine fix to jump start the day can make their own at the coffee station and if a healthy start is in order, the salad bar has you sorted. If the weather is good, grab a sunny spot on the balcony and dine alfresco with the sound of the waves lapping the shore for company. 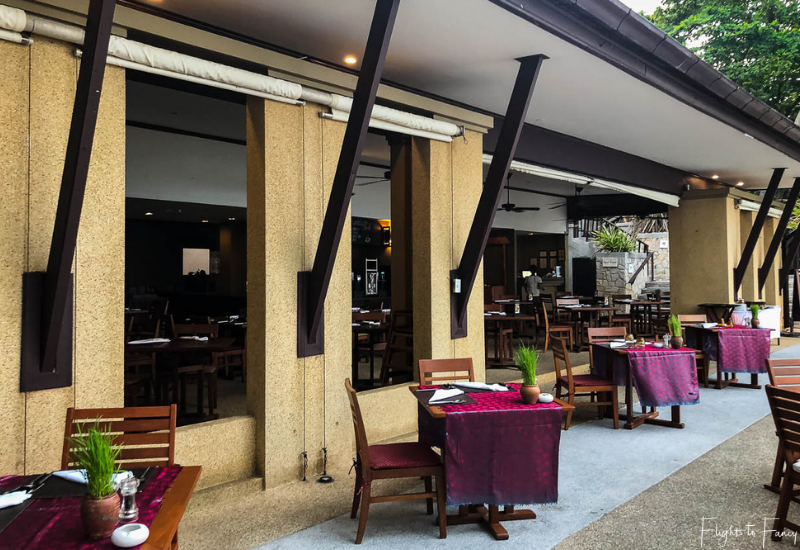 The Sabai Restaurant at Impiana Resort Chaweng Noi also serves lunch and dinner to hungry guests and we visited one balmy evening during our stay. 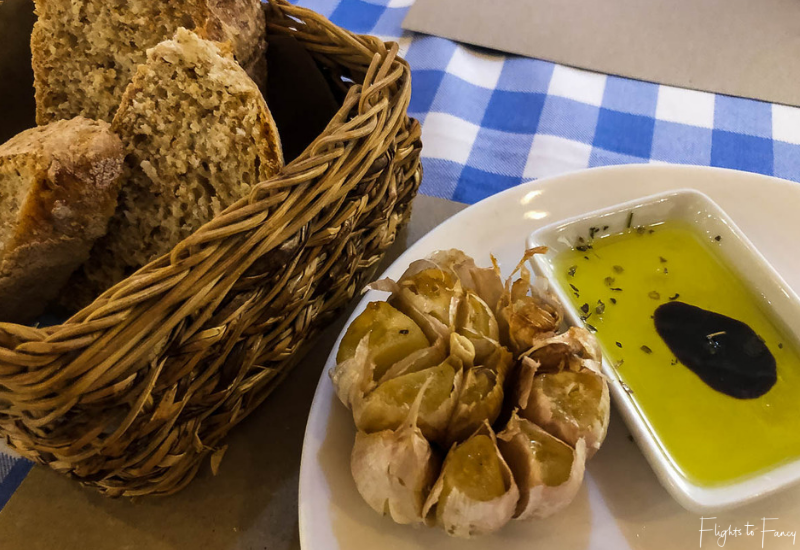 The menu is diverse and caters to most tastes. Think seafood, steak, rack of lamb, pasta, soup, pizza, Thai favourites and decadent desserts. 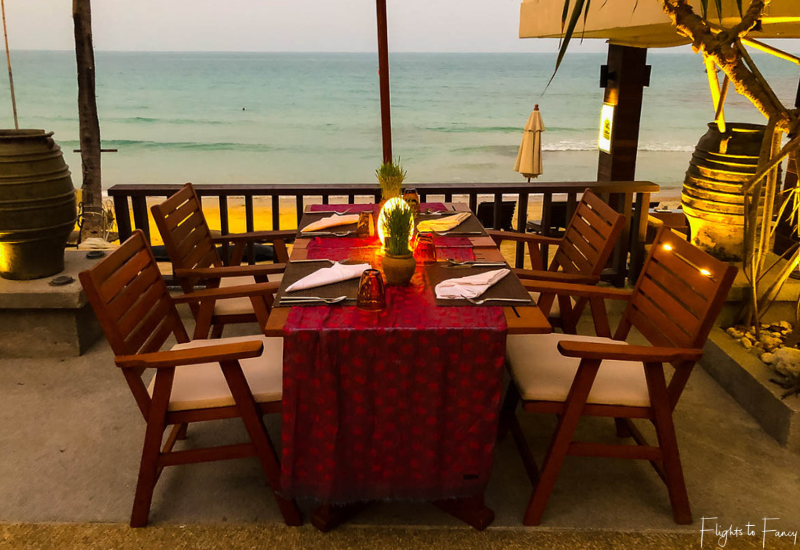 We arrived at 7pm and scored a prime table over looking Chaweng Noi Beach. The beachfront tables were popular and filled quickly as other guests arrived. Aek and Sunny were our servers for the night and were attentive without being intrusive. The Hubs chose the Sea Bass special while I opted for the Spinach and Ricotta Ravioli. 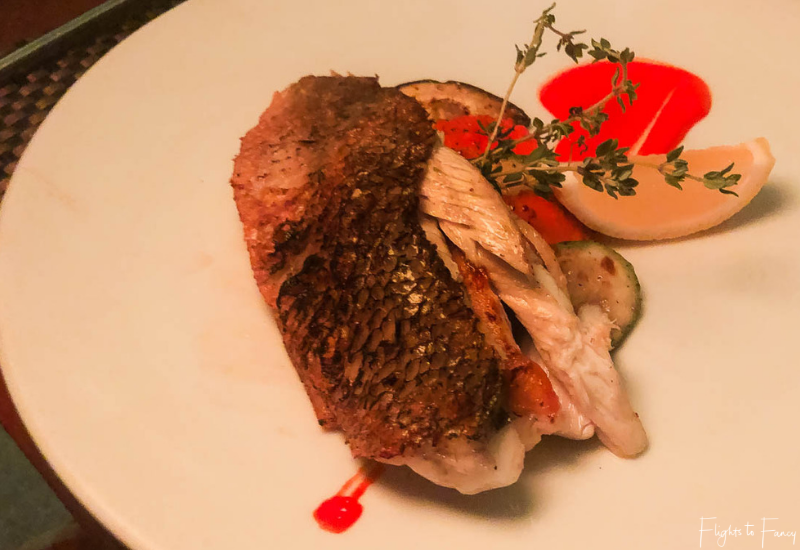 The fish was fresh, tender and the crispy skin was perfectly charred. A smear of vivid red capsicum sauce enhanced the barbecue flavour and the side salad kept the dish light. 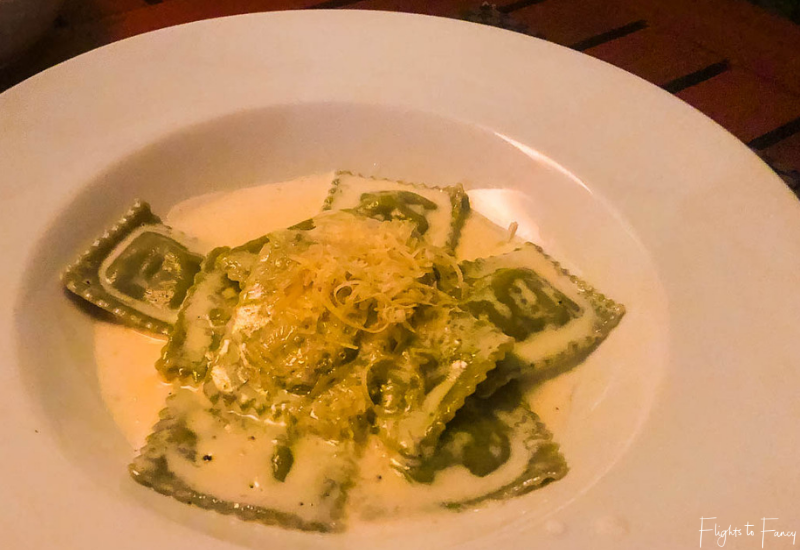 My ravioli was slathered in a mild creamy sauce which perfectly complimented the dish without being overpowering. A generous shaving of real parmesan topped the little pillows and I added lashings of cracked black pepper. Delicious! Wine is usually expensive in Thailand and I tend to avoid it, but I splurged on a couple of glasses of Sauvignon Blanc for this very special meal. 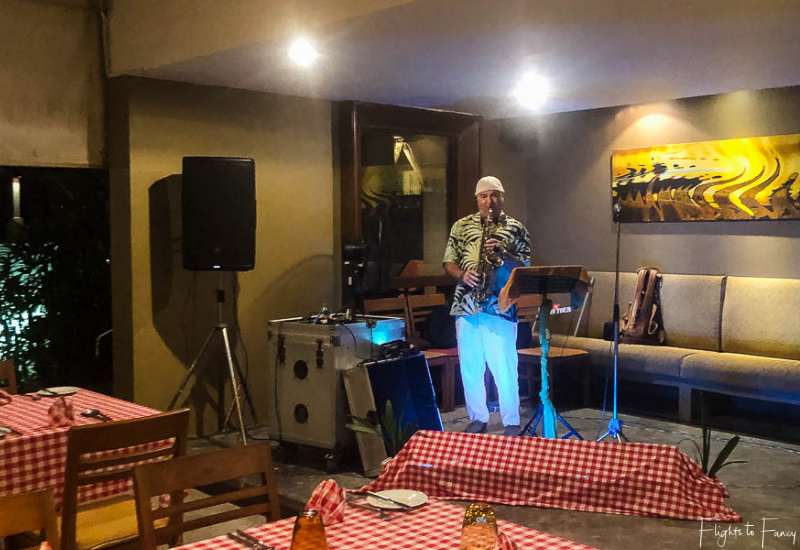 Dinners at the Sabai Restaurant at Impiana Resort Chaweng Noi are always accompanied by live music and on the night we dined we were treated to an excellent saxophone soloist. One day during our stay the heavens opened with abandon and we had no desire to leave the resort and battle the weather. We opted to stay in and sample some of the onsite activities at Impiana Resort Chaweng Noi. First up was a traditional Thai cooking class. I like to think of myself as a bit of a dab hand in the kitchen and Thai features regularly on the menu at our house, but I’m always interested in picking up some new tips. 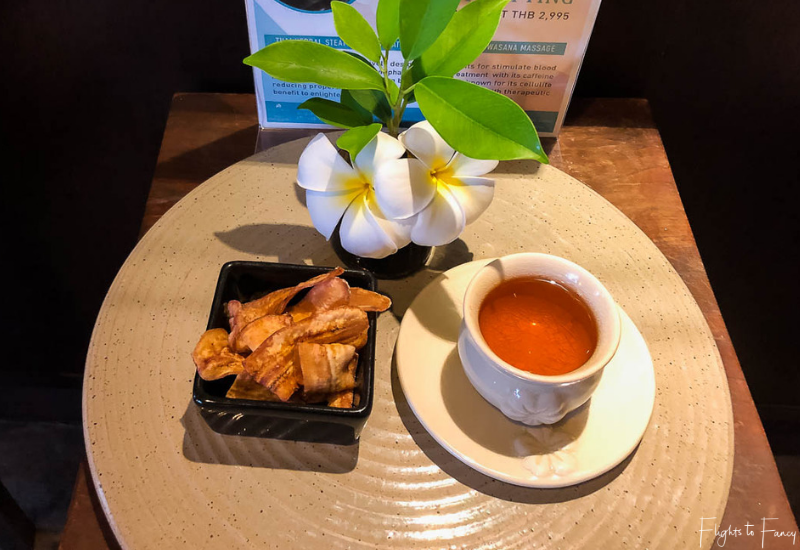 Thai cuisine is simple, varied and delicious. 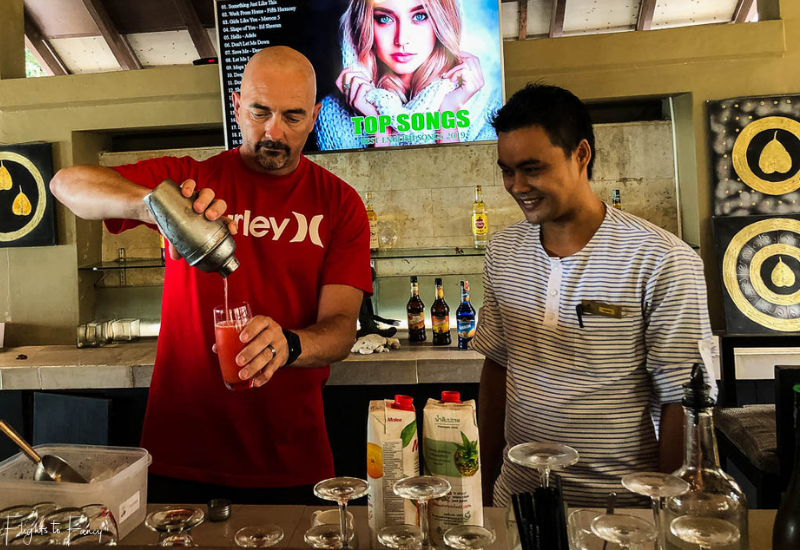 We were greeted warmly by Mas, the head chef at Sabai Restaurant Impiana Resort Chaweng Noi, and introduced to Rong who would put us through our paces for the next few hours. There are a number of menus for guests to choose from and each includes three dishes. We chose package ‘C’ and swapped one dish to Tom Yum Goong/Gai because we don’t care for pork. Rong lead us to our beautifully decorated stations in the dining room and explained the various ingredients on display. First on the menu was Gai Phad Mamuang (stir fried chicken with cashew nuts). We sliced all the ingredients and browned the chicken in the hot pan before adding the capsicum and onion. 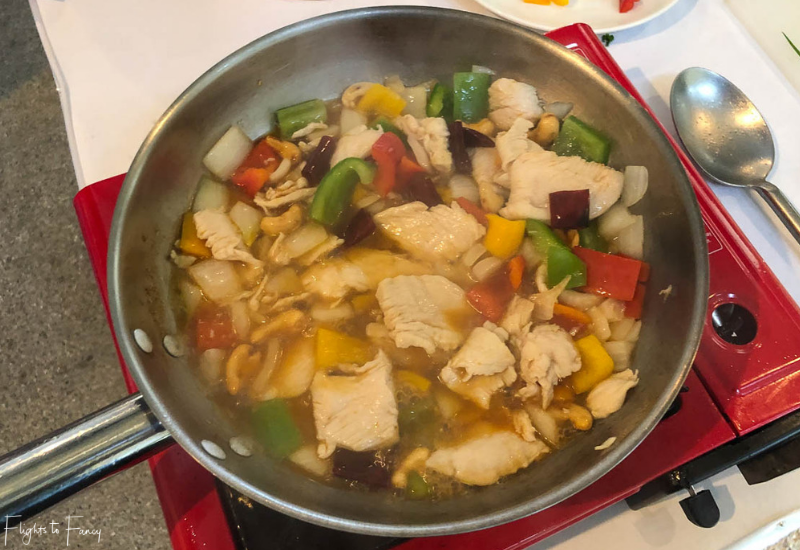 A splash of stock, soy sauce, oyster sauce, chilli oil, a sprinkle of sugar and a handful of cashew nuts were all added to the pan a few minutes later. The Hubs also added a few sliced mushrooms, but I don’t eat fungus. We let our creation simmer for a few more minutes before turning off the heat and adding the spring onions right before serving. I have made this dish many times before, but I usually use chilli jam and have never added stock. The result was a lighter flavour and it was divine served over rice. I was careful not to eat too much as I knew there were two more dishes to come! Back at the station, we started to prep our next dish, Tom Yum Goong (spicy and sour soup with shrimp). The Hubs loves seafood so he was really looking forward to this one, but as I don’t eat it, I simply swapped the prawns for chicken resulting in Tom Yum Gai. 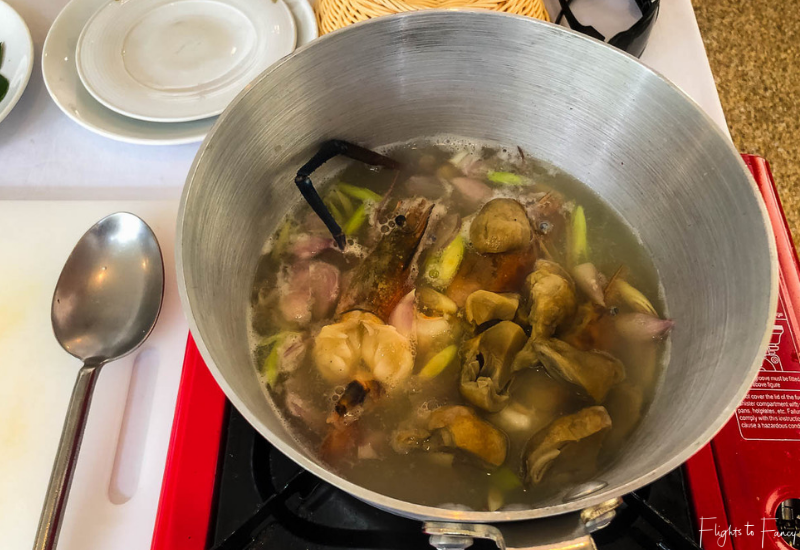 We grabbed a fresh saucepan each and added lemongrass, galangal, chili and a squeeze of lime to a healthy measure of chicken stock and brought it to the simmer. When the soup was bubbling away nicely we added fish sauce, soy sauce, fresh tomato, a pinch of sugar and chilli oil. 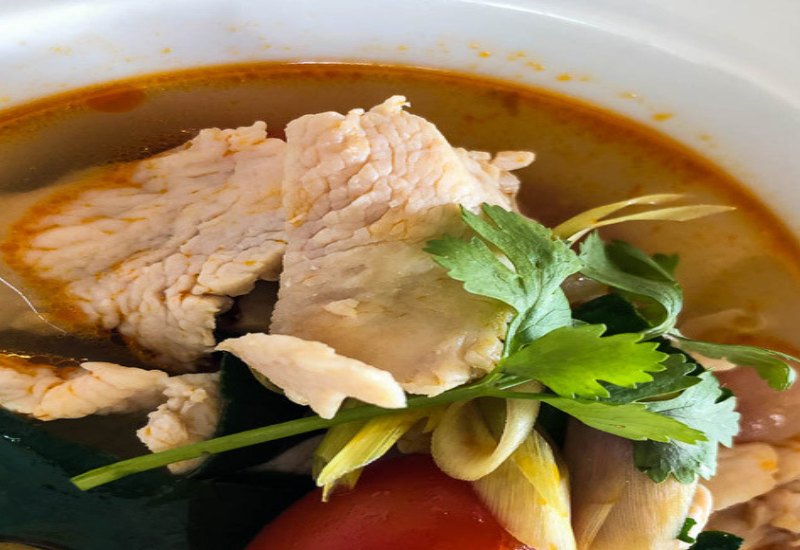 The Hubs loves soup and really enjoyed his Tom Yum Goong. It’s not a dish I would normally order, but I enjoyed the light fresh flavours much more than I thought I would. 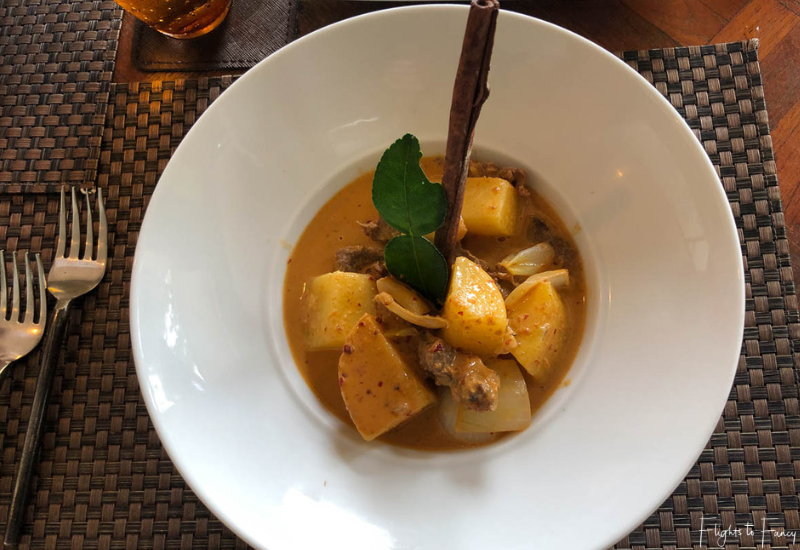 The final dish was Gaeng Massaman Nuea (beef curry with peanuts and potatoes). Beef Massaman is one of my all time favourite Thai dishes and I was salivating at the thought of the finished dish. 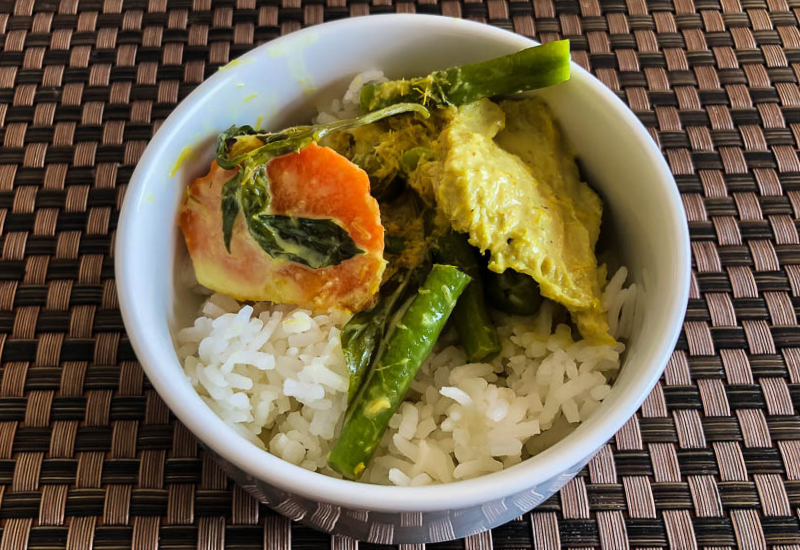 Massaman takes an age to cook, but Rong adapted the recipe to make it possible to recreate it in our cooking class. 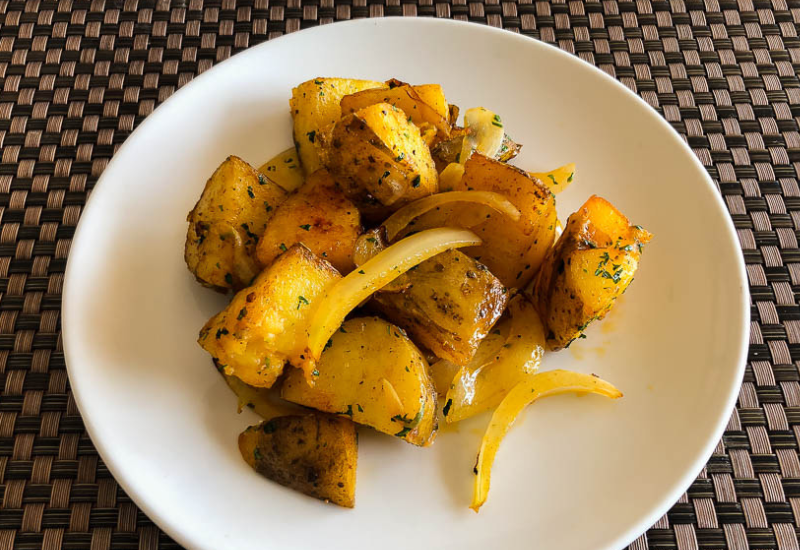 He had prepared the curry paste ahead of time and pre-cooked the potato. He also asked us to slice the beef very thinly to cut down on the cooking time. 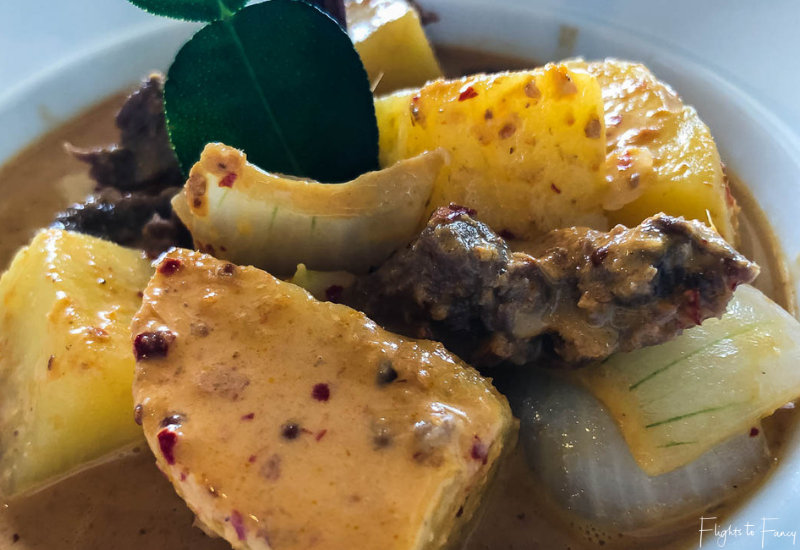 We simmered the beef, curry paste, potato, onion, palm sugar and fish sauce in coconut milk until tender. The flavour of the finished dish was there, but it didn’t have the richness that a traditional slow cooked Massasman does. Rong didn’t ask us to add peanuts which I though was a little odd as I always add them to my version. When we were full to the brim, Rong joined as at our table and presented us with a cook book so that we could recreate the dishes at home. In additional to the cooking classes, Impiana Resort Chaweng Noi offers a different activity every day. If you are feeling competitive why not challenge your mates to American 8 Ball, Foosball, Beach Soccer or Beach Volleyball. Impiana Resort Chaweng Noi offers guest an opportunity to learn a new skill during their stay with fruit carving, massage, napkin folding, flower arranging and cocktail making lessons all available on site. All the activities are free for guests with the exception of the cocktail class which at just ฿99 simply covers the cost of your creation. I loved the movie Cocktail when it first came out in 1988 (was it really that long ago???) so we decided to give Tom Cruise a run for his money and step behind the bar. The cocktail class at Impiana Resort Chaweng Noi is held in the relaxed setting of the Tamarind Bar and Lounge. Ting, our expert Bar Manager, took us through our paces as we made two cocktails under his watchful gaze. 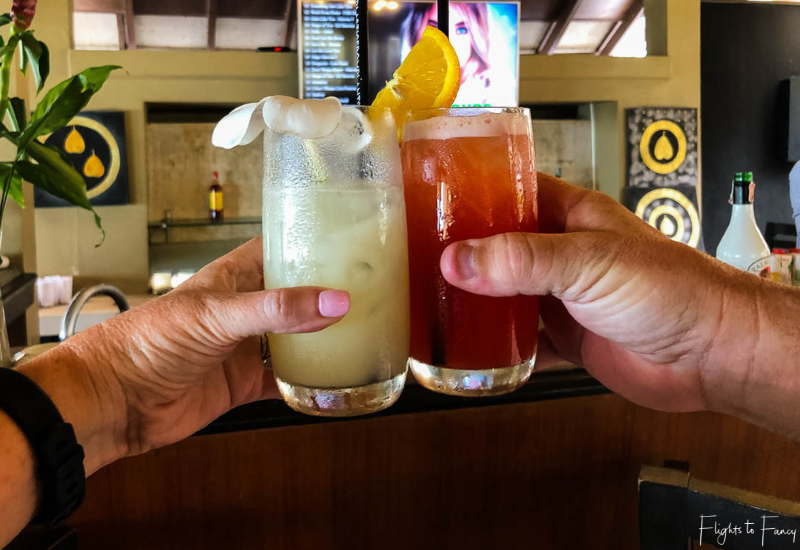 I mixed up a creamy Pina Colada and The Hubs created a classic Mai Tai that packed a punch. It was touch and go, but I think his Mai Tai just pipped my Pina Colada at the post. When we were done playing mixologist, we settled into the comfy lounges to enjoy the fruits of our labour with an afternoon snack. 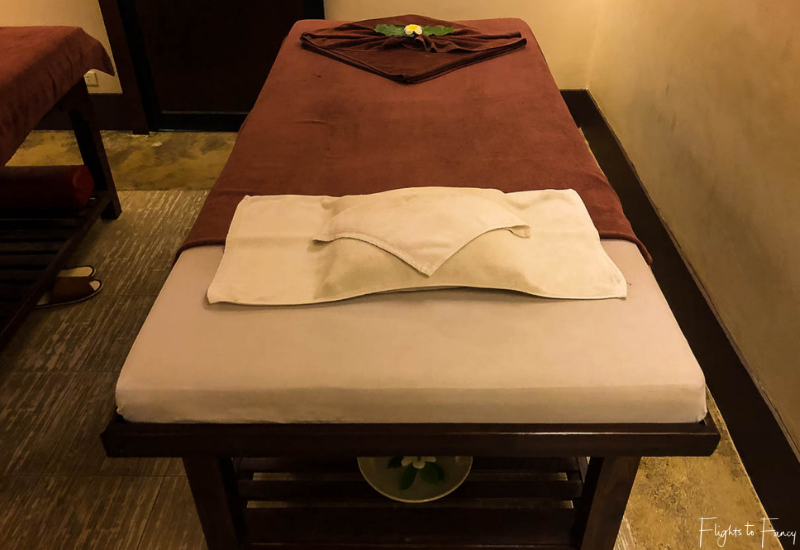 Thailand is famed for it’s massage technique and it would have been remiss of me not to indulge while I was in Koh Samui. 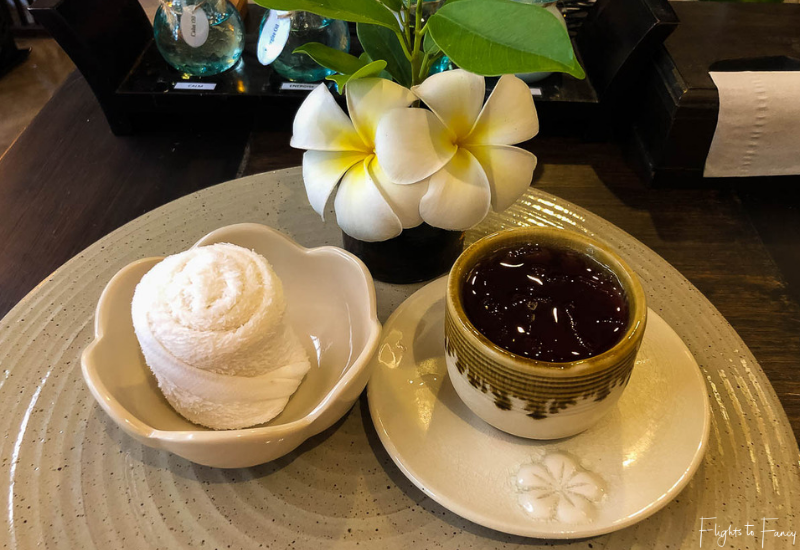 The Swasana Spa at the Impiana Resort Chaweng Noi was about 10 steps from our room so how could I not go? After looking through the menu, I selected the signature massage and eagerly waited for my appointment. The day of my booking was stormy and being pampered was exactly what the doctor ordered. I arrived 15 minutes early for my appointment, partly because I was asked to, but mostly because I was really keen. 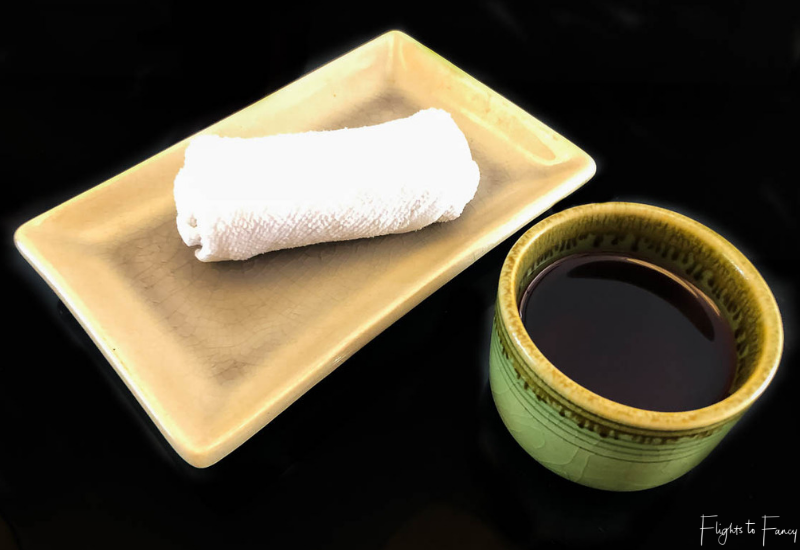 On arrival I was seated in reception and presented with a cool towel and a glass of Roselle tea. I’m not much of a tea drinker, but this fruity blend was delicious. I chose the calm oil from the four on offer and asked for medium pressure. While I do enjoy a firm massage, firm in Thailand can mean brutal and I had no desire to end up bruised. This was the third massage of my trip and it was the best. When I walked out floating on air, I was presented was a warm tea and some yummy banana crisps. Sure a massage at Swasana Spa costs slightly more than a basic massage on the beach, but the extra investment is most certainly worth it. 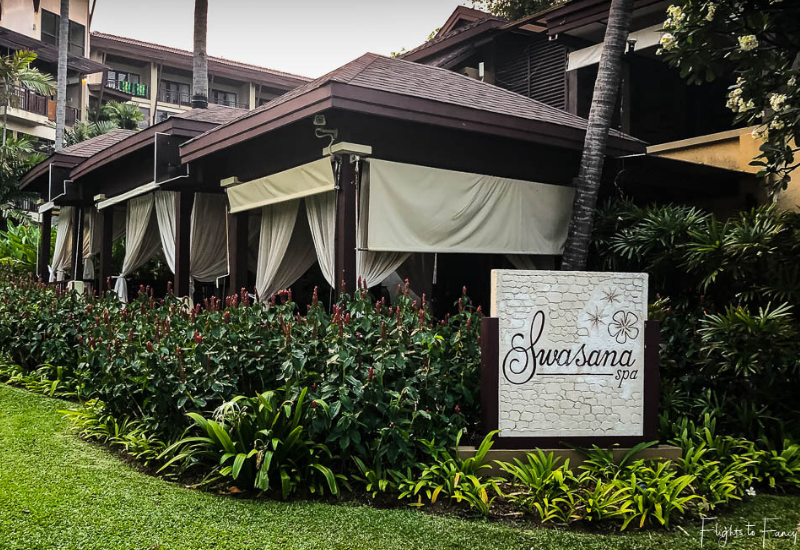 Swasana Spa is open from 10am – 8pm and offers both indoor rooms and outdoor cabanas which can accommodate singles or couples. Services at Swasana Spa are very much in demand so make sure you book early. 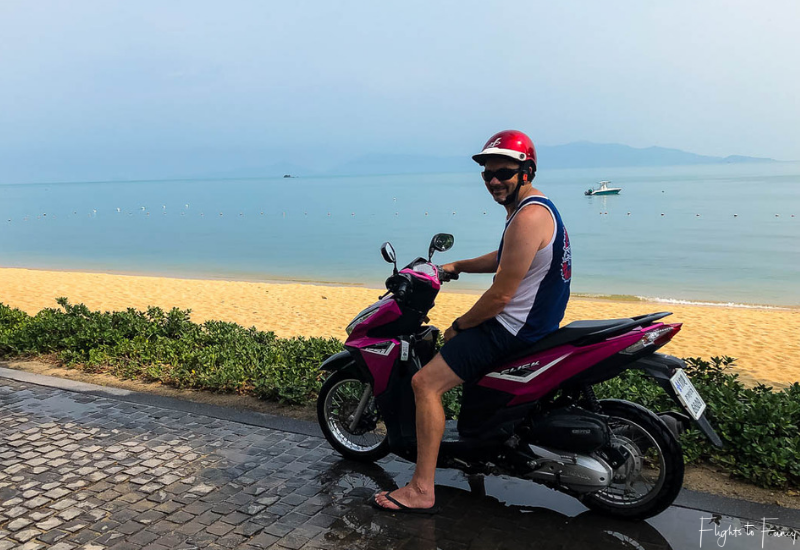 We wanted to explore all Koh Samui had to offer during our three day stay at Impiana Resort Chaweng Noi and the best way to do that is on two wheels. The Hubs has been on bikes for 30+ years and I trust him implicitly when I am on the back, but riding in Thailand is not a great idea for first timers. The Impiana Resort does not hire bikes themselves and they recommended nearby Yui Spidernet when we asked. I was apprehensive when they asked us to leave a passport or a ฿5000 deposit. We have hired scooters many times in Thailand, Bali and Vietnam and have never once been asked to leave a passport or a deposit. In fact, I tell people NOT to do this. Against my better instincts and only because they were recommended by Impiana I agreed. When we returned the scooter they tried to blame us for the tiniest scratch on the plastic. The photos we took when we picked it up were not clear enough to tell whether it was already there. The male staff member became agitated and was muttering that we had to pay, but The Hubs wasn’t having a bar of it. The female staff member joined the conversation and after a heated discussion in Thai she decided we could have the passport back. I wouldn’t use Yui Spidernet again as having your passport held hostage was stressful, particularly when we flew out that night. In hindsight though, it was probably better than leaving cash as I am almost certain they would not have returned the full amount where returning half a passport wasn’t an option. If you do decide to use them, take a million photos of every surface and be prepared to pay for even normal wear and tear. That said, the scooter itself was immaculate and performed perfectly. We made the quick 5 minute trip into Chaweng many times. Those seeking action and adventure can hire a jet ski from the beach or try their hand at parasailing. Chaweng is also the centre of Koi Samui’s nightlife and we popped into the Hard Rock Cafe one night to add another Hurricane Glass to my collection and catch a band. 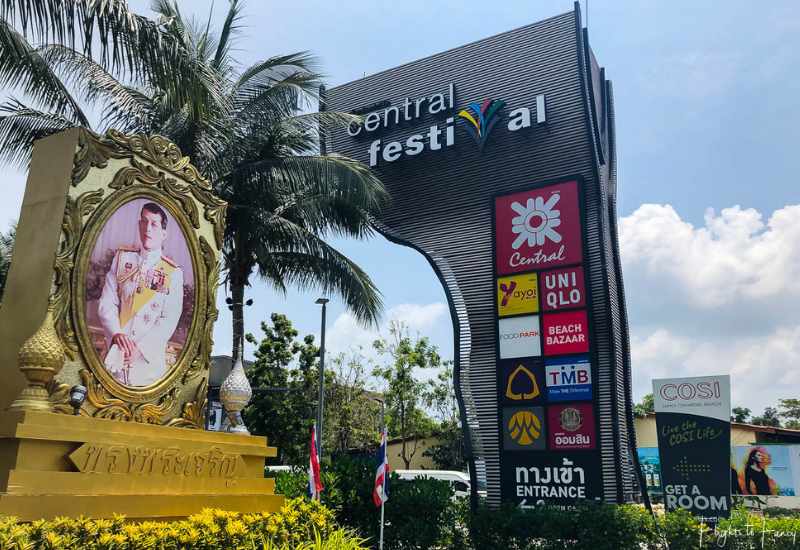 Shopaholics will be spoiled for choice at Koh Samui’s premier mall Central Festival and restaurants litter the streets. 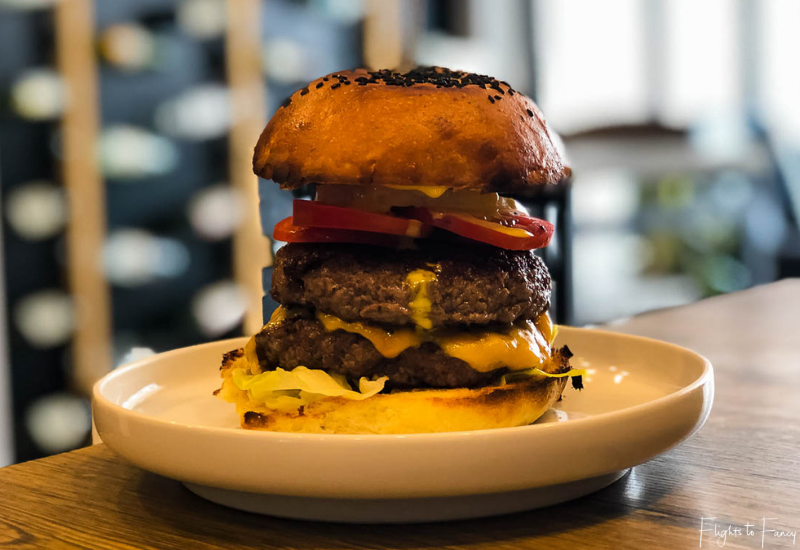 I really recommend the Olive Tree for sublime Greek and the Hungry Wolf for amazing burgers. Ride about 10 minutes in the opposite direction and you will hit Lamai. The beach is quieter here, but no less pretty. I popped into Hair Salon by Jah for a much needed blow dry. 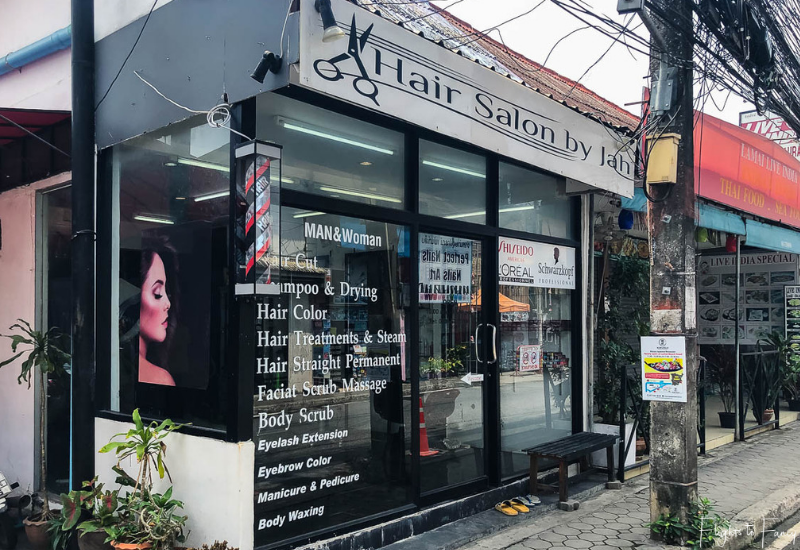 It was only ฿200 and was seriously the best blow dry I have ever had. The head massage was sensational. Go see them, you won’t regret it. Fisherman’s village in Bophut is about 20 minutes away and if you happen to be in town on a Friday head to the night markets. If you want to explore a little further afield, why not hop over to Koh Phangan. Koh Phangan is world famous for its full moon parties and it’s just a short boat trip from Koh Samui. Book your ferry with Klook from Koh Samui to Koh Phangan for just AUD$11. Wherever you want to go or whatever you want to see, guests at the Impiana Resort Chaweng Noi have easy access the best of Koh Samui. We truly enjoyed our stay at Impiana Resort Chaweng Noi. 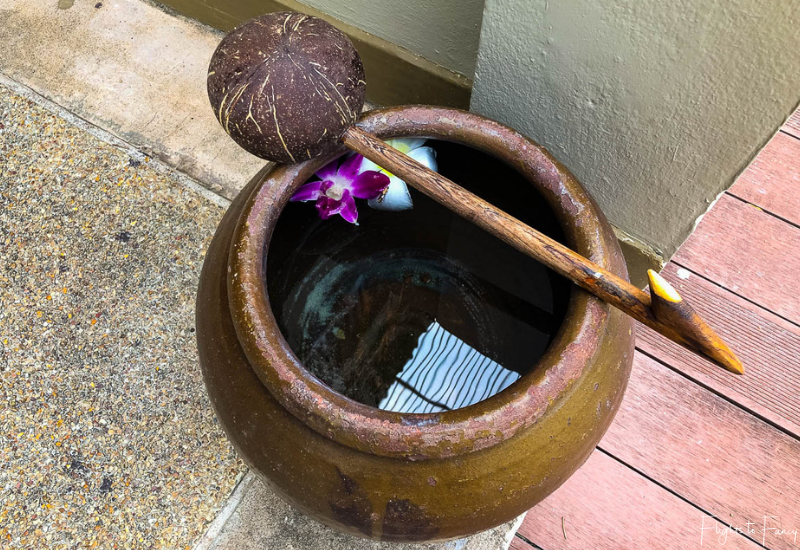 Their hospitality played a huge part in making our first visit to Koh Samui so special. Have you been to Koh Samui? What was the most memorable part of your trip? Disclosure Statement: I paid for my accommodation at Impiana Resort Chaweng Noi in full. Impiana Resort Chaweng Noi graciously provided a complimentary dinner, a massage, a cocktail making demonstration and a Thai cooking class for the purposes of this review. The information in this article is based on my own personal experiences and has not been influenced in any way by the brand(s) featured. This post may contain affiliate links which if clicked may earn me a small commission on purchases at no extra cost to you. 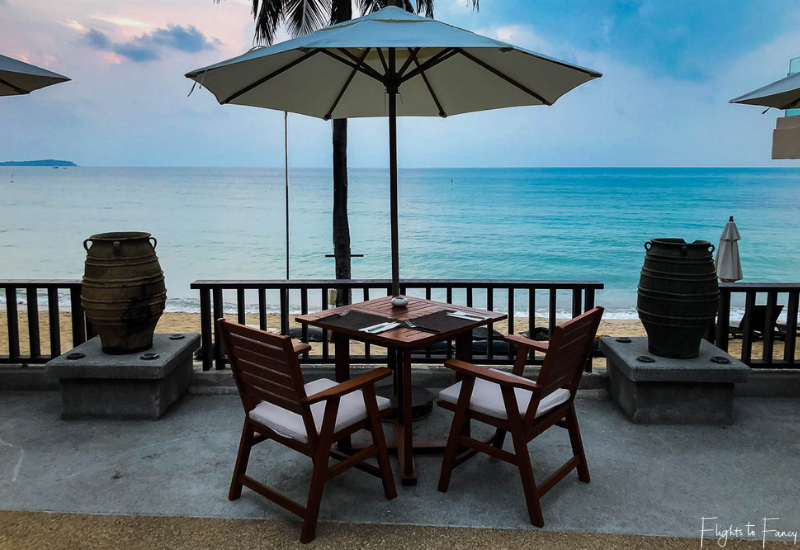 Though I have visited for Bangkok but never gone to Koh Samui and this luxury stay at Impiana Resort Chaweng Noi looks worth. 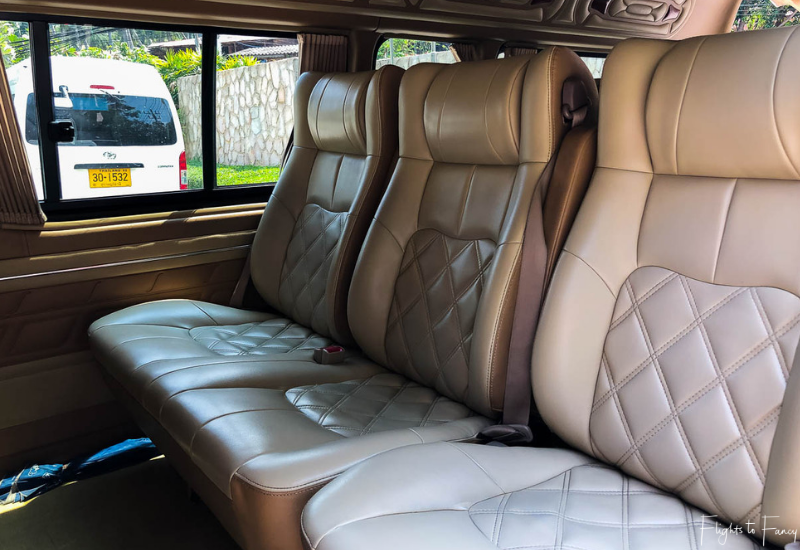 It is good that premium luxury is coming at affordable rates. Good to know you got a complimentary massage of 15 minutes with 10% off on tours. I will book that spa early so that I get my preferred time slot. Your room looks very clean, spacious, well designed and a view of the beach. It is good that that put an urn full of water so to keep away the sand when you enter directly from the beach. Thailand is always so much fun. Koh Samui is lovely. 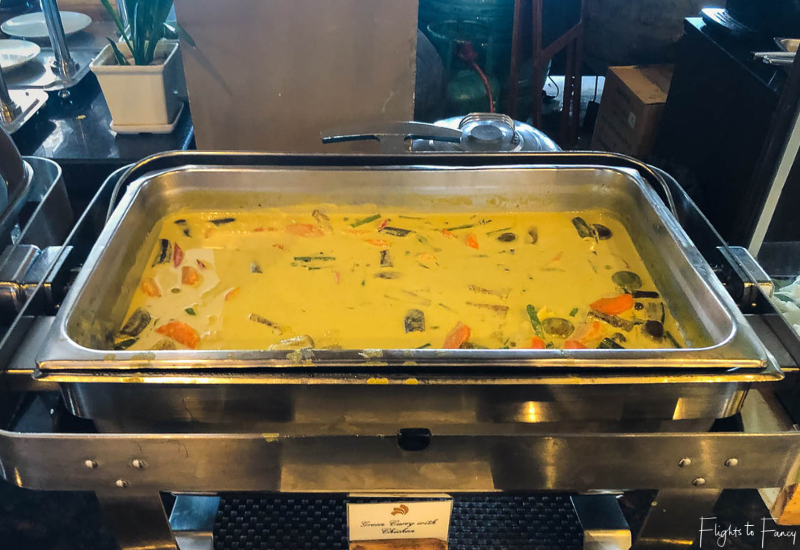 I love the hospitality of Thai hotels. You sure had a great time at Impiana Resort Chaweng Noi. The place looks upbeat, cheerful, modern and traveler friendly. The great food, cooking class and the complimentary massage is a winner for me already. It is very important to have a hotel that serves your purpose of your holiday, it enhances the fun of it. 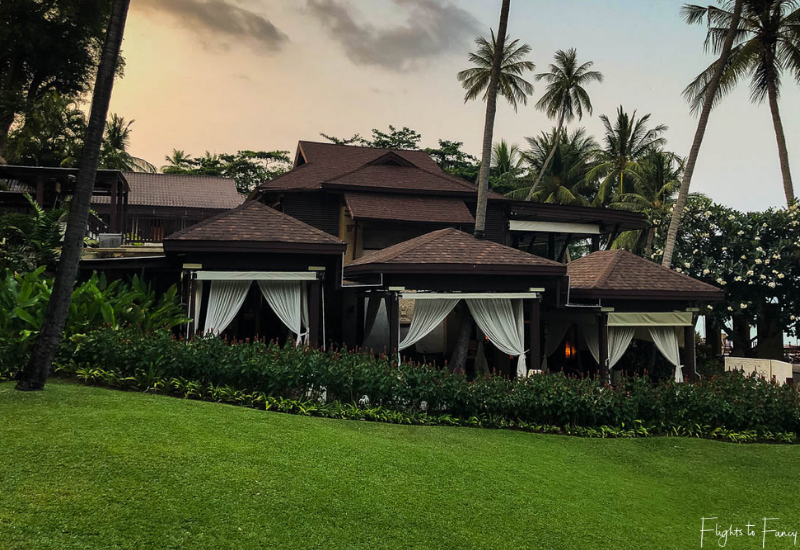 Thailand is my recent favorite country to visit (I know I’m quite biased considering my island Philippines have tons of beautiful places as well), however I couldn’t deny that fact how amazing many Thailand resorts are. 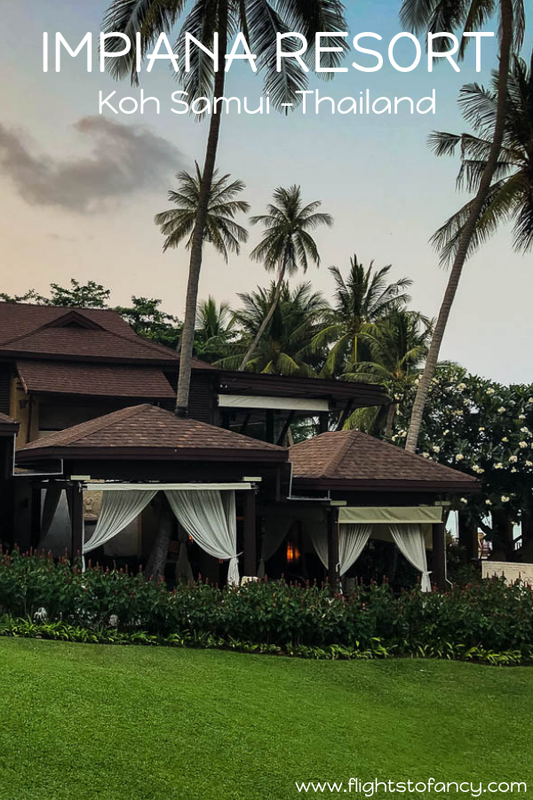 First, they have more affordable luxury resorts than here in the Philippines, and in Thailand its okay to spend because it is worth it – the services are topnotch and its utmost pure luxury. I never felt ripped-off when in Thailand. Definitely saving your guide coz I want to visit here with my boyfriend! 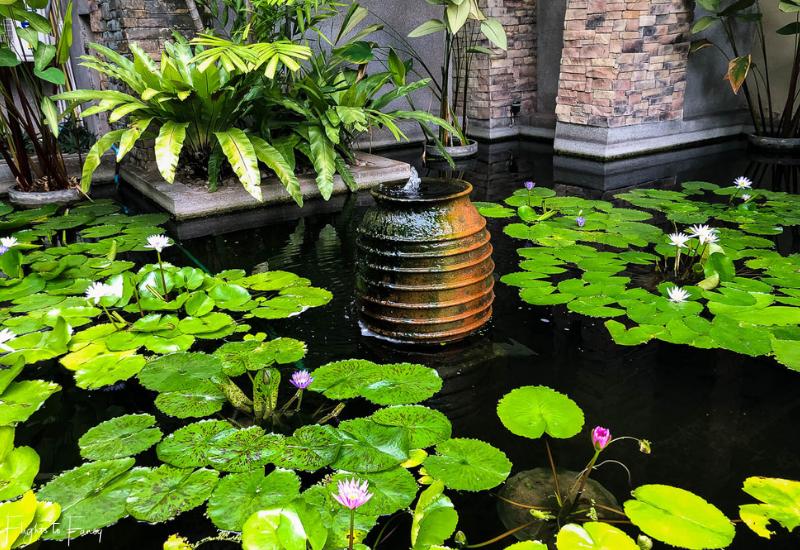 Oh, how I miss staying in resorts in Southeast Asia after reading your review! Something that you won’t find in the US with the same price, facilities, and amenities. lol. Your breakfast made me hungry again, and I just had breakfast a couple of hours ago. Haha… The cooking class offered in the hotel sounds interesting. The way you described it, made cooking Thai food is easy. Thank you for sharing your honest review about the resort. I have never been to Thailand yet although its such a popular destination to visit from India. After reasing this I am more interested to pay a visit and spend time in affordable luxury. Those rooms and facilities in 184 AUD is just amazing. I loved the cute towel decoration in the bedroom. I also find Agoda one of the best portals for hotel search in Asia. Cooking my favorite Thai food is another attraction ofcourse. 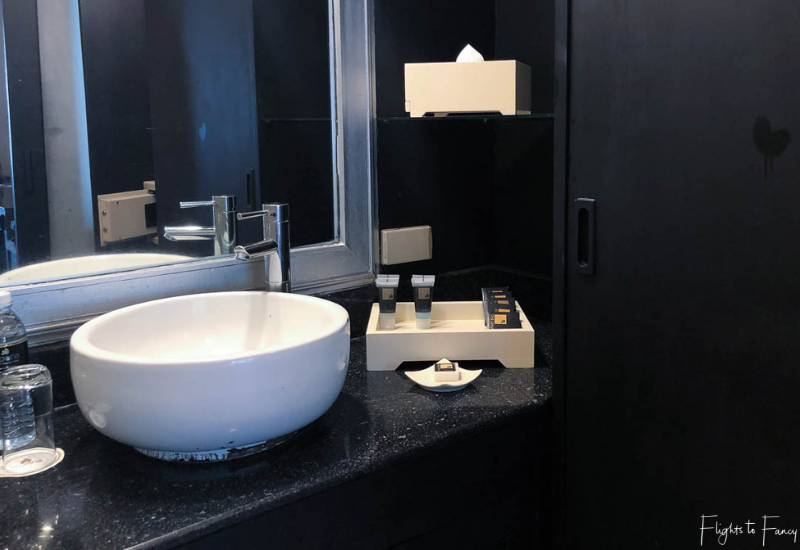 I agree, Thailand is such a great place to find really affordable luxury, especially when the price is combined with the warm and friendly service you receive. 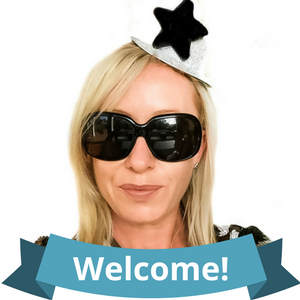 I love that you are like me when you’re making the choice, you create a shortlist based on your personal criteria and then narrow it down, we do the same! 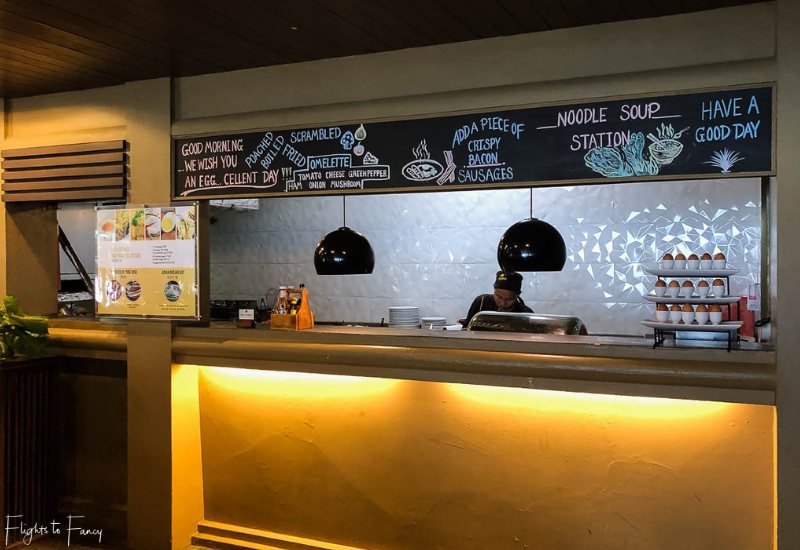 Looks like you found a gem in the Impiana Resort Chaweng Noi, I like the style and decor, your room and public areas look great, the food and drink offering appeals, and they have a nice looking pool too. What a great stay you had at the Impiana Resort in Koh Samui, Thailand! 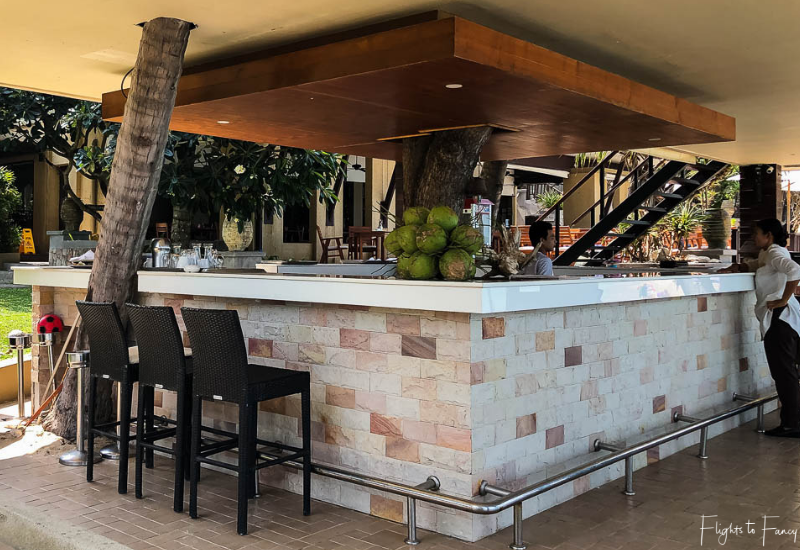 I was already a fan of adding it to my places to visit when you mentioned that the food was good and the beach bar fabulous. But throw in optional activities like the cooking and cocktail classes and this makes for a memorable vacation. Thank you also for the thorough list of how to get there since logistics from far away can make or break a trip. What a beautiful resort in Koh Samui. The accommodation looked perfect and I loved the little touches on the bed when you arrived. 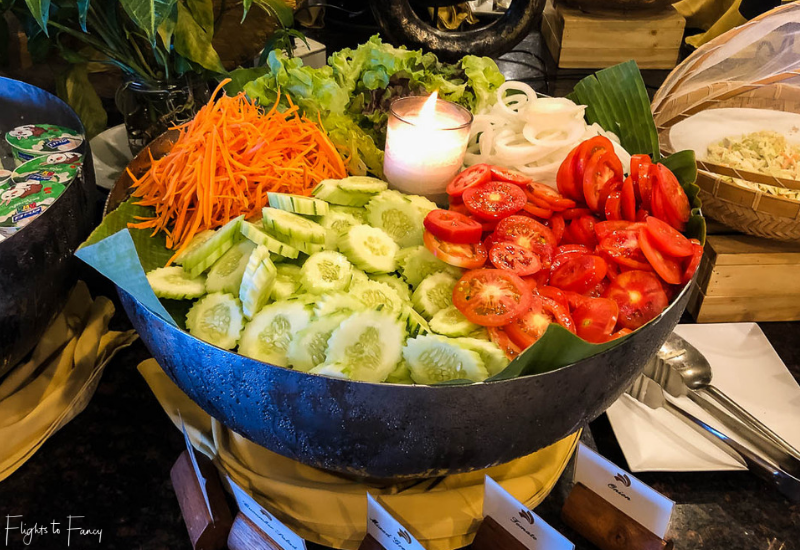 The breakfast buffet looked ample with lots of choices. The views were awesome from the restaurant. Thanks for including transfer details in the article. 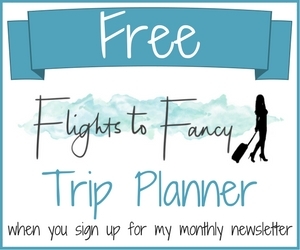 Loved your review and now I really want to go to Thailand, specifically to have the vacation you had. Thanks for sharing.